Boston University swept a home and home series with #8 Providence, taking a 5-3 road win and 4-2 victory at home. Junior Deziray De Sousa (Montreal, Que.) enjoyed a career-best three-point game (1g, 2a) on the road Friday, setting up the game-winning tally in that victory en route to collecting all three of her points in the final frame. Meanwhile, Corinne Schroeder (Elm Creek, Man.) made 58 saves and earned two wins for the Terriers. UConn extended its winning streak to six games, toppling New Hampshire twice last weekend. The Wildcats had gone undefeated in their last nine outings (7-0- 2). Natalie Snodgrass (Eagan, Minn.) potted three goals for the Huskies, and the sophomore now has nine goals in her last five games. 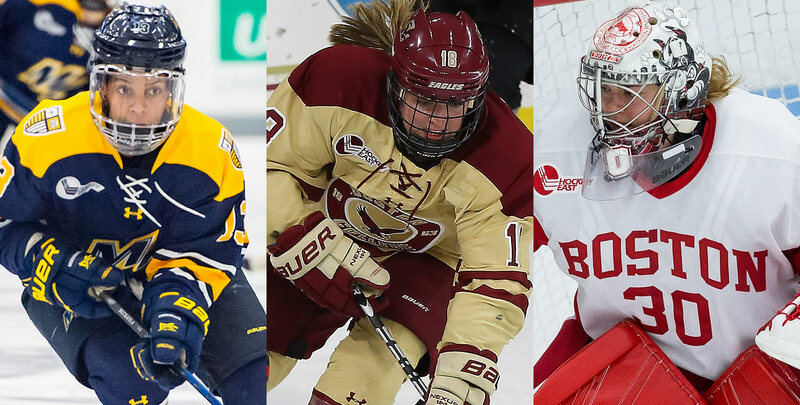 #10 Boston College and #3 Northeastern split a weekend series between the two nationally ranked powers, with the home team emerging victorious in each outing. Megan Keller (Farmington Hills, Mich.) notched four points against the Huskies, as the senior defenseman scored two goals in the first period of a 7-5 win on Saturday and assisted on the game-winning goal. 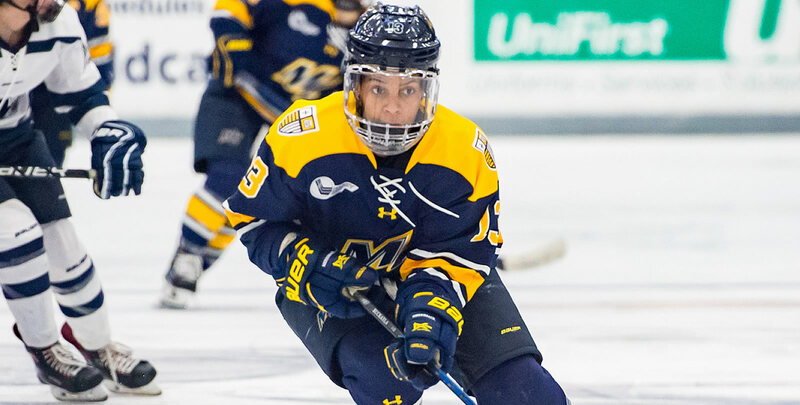 Merrimack took a split at Vermont, as junior Mikyla Grant-Mentis (Brampton, Ont.) racked up and NCAA-high six points (2g, 4a). 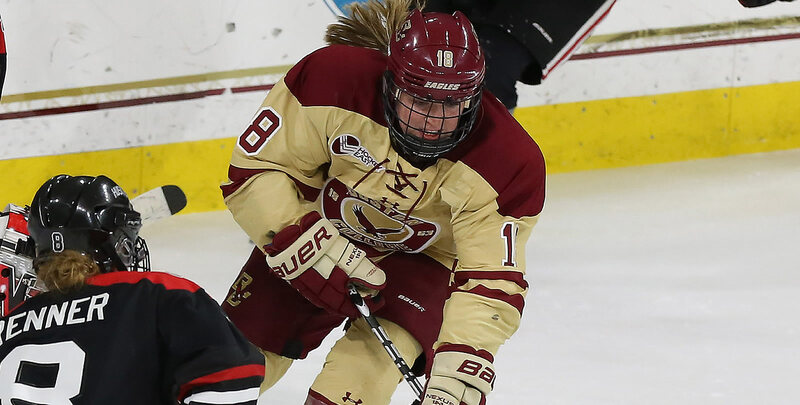 On Friday, she became just the 11th player in Division I women's hockey history to score two shorthanded goals in a single game, finding the back of the net twice for th e Warriors on the penalty kill in a 4-1 win over the Catamounts. She scored the g ame-winning goal on Friday as part of a four-point day (2g, 2a) before dishing o ut two assists on Saturday. Maine earned three points in Hockey East play over Holy Cross in Orono. Carly Jackson (Amherst, N.S.) earned a 15-save shutout in Sunday's 3-0 win for the Black Bears. Mikyla Grant-Mentis (Jr., F; Brampton, Ont.) racked up and NCAA-high six points (2g, 4a) in two games at Vermont, a weekend split for the Warriors. On Friday, she became just the 11th player in Division I women's hockey history to score two shorthanded goals in a single game, finding the back of the net twice for the Warriors on the penalty kill in a 4-1 win over the Catamounts. She scored the game-winning goal on Friday as part of a four-point day (2g, 2a) before dishing out two assists on Saturday. Kelly Browne (Fr., F; Burlington, Mass.) picked up a goal and an assist in the Eagles' win over #3 Northeastern on Saturday, part of a weekend split with the Huskies. She won 25 faceoffs in two games over the weekend and registered 10 shots on net, both totals were second among all league freshmen. Corinne Schroeder (So., G; Elm Creek, Man.) picks up her second consecutive Defensive Player of the Week award after the sophomore made 58 saves in a weekend sweep of #8 Providence. 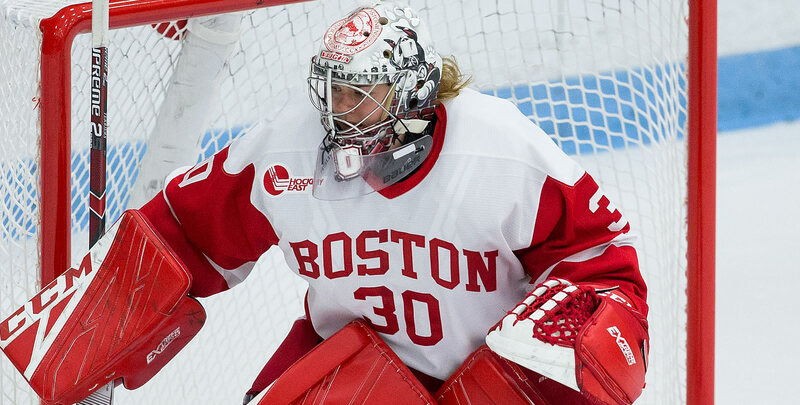 Her weekend included a 32-save outing in Saturday's 4-2 victory, while she also kicked out all 17 shots she saw in the third period of Saturday's win, seven of which came her team was shorthanded and up by just one goal. Megan Keller, BC (Sr., D; Farmington Hills, Mich.) Notched four points last weekend in a split with #3 Northeastern. She scored two goals in the first period of a 7-5 win over the Huskies on Satur day and assisted on the game-winning goal. Deziray De Sousa, BU (Jr., F; Montreal, Que.) Enjoyed a career-best three-point game (1g, 2a) in a 5-3 road win over #8 Providence on Friday. She set up the game-winning tally in that victory en route to collecting all three of her points in the final frame. Kaleigh Donnelly, BU (Fr., F; Wellesley, Mass.) Lead all league rookies with three assists during a weekend sweep of #8 Providence. She dished out two assists in a 4-2 win on Saturday, including one on the decisive strike. Natalie Snodgrass, UConn (So., F; Eagan, Minn.) Potted three goals in a weekend sweep o ver New Hampshire, who had previously gone undefeated in its last nine games (7-0-2) while helping the Huskies extend their winning streak to six games. The sophomore now has nine goals in her last five games. Morgan Fisher, UConn (Jr., G; Vernon, Conn.) Kicked out a total of 71 shots in a we ekend sweep over New Hampshire, posting a 32-save shutout on Friday, her first of the year, and a 39-save performance on Saturday. She has now won each of her last five s tarts during UConn's current six-game winning street. Marie-Jo Pelletier, UNH (Sr., D; Dalhousie, N.B.) Tallied three points in three games for New Hampshire last week, including the game-tying goal on Tuesday at Yale. Saana Valkama, UVM (Sr., F; Pirkkala, Finland) Posted three points (1g, 2a) in a 5-4 win over Merrimack on Saturday. She also registered a plus-three rating for the Catamounts.